Al Shabaab rebels monitor movement of Somali Christian returning from Kenya for visit. NAIROBI, Kenya (Morning Star News) – Muslim militants still controlling part of the Lower Shebelle Region of Somalia have jailed and tortured a Christian for converting from Islam, sources said. Al Shabaab rebels seized Hassan Gulled, 25, on March 23 in Bulo Marer near Qoryoley District, they said. Gulled, who had fled to Kenya in 2007 in search of safety and a better life, had left Kenya on Feb. 27 to visit family in Somalia, sources said. 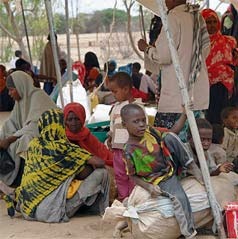 Gulled is one of dozens of Somali refugees in Kenya facing dangers from Al Shabaab extremists as they return to Somalia following the establishment of a new government in Mogadishu and the weakening of Al Shabaab, which once held large swathes of territory. As Gulled was only visiting family in Somalia, his wife remained in an undisclosed city in Kenya. Al Shabaab extremists in Kenya who knew of his Christian activities there apparently contacted members of the militant group in Somalia, who monitored his movement for three weeks before seizing him, sources said. “Four masked, armed militia from Al Shabaab took Gulled into a Land Cruiser and then drove away as family watched him helplessly,” said one source. Another source said it was confirmed that Gulled has been jailed in Bulo Marer. A militant Islamist group with ties to Al Qaeda, Al Shabaab has a base in Bulo Marer, about 50 miles from Mogadishu. Last week, however, Somali government troops backed by African Union Mission in Somalia (AMISOM) forces had reportedly taken control of nearby Qoryoley. Al Shabaab has vowed to rid Somalia of Christians, who meet secretly due to persecution – besides Al Shabaab, the government and many in Somali society also view leaving Islam as deserving of death. Gulled became a Christian in Kenya in 2010. He married there in 2011 and has no children. “Gulled’s wife is very distressed and worried that she might not see her husband again,” a source said. Many Somali members of Christian fellowships in Kenya have returned to Somalia after formation of a Somali government on Aug. 20, 2012, which replaced the Transitional Federal Government, said the source, who requested anonymity. Siad and his wife, who converted to Christianity in 2000 according to a source who used to worship with them, had moved to Beledweyne from Doolow eight months before, after Somalia’s transitional federal government and African Union Mission in Somalia troops captured Beledweyne from Al Shabaab rebels. The area was under government control and there was no indication that the killers belonged to the Al Shabaab rebels who have vowed to rid the country of Christianity, but the Islamic extremist insurgents were present in Buulodbarde, 20 kilometers (12 miles) away, and Christians believed a few Al Shabaab rebels could have been hiding in Beledweyne.